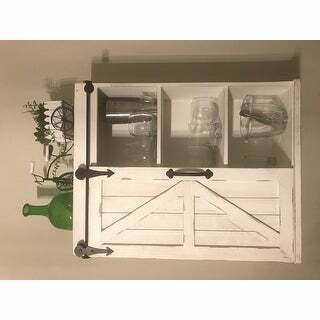 Decorate your home in vintage farmhouse style with this unique hanging wall shelf with sliding barn door. Newly designed in a smaller, one door size, this hanging cabinet will organize spaces if you only have a bit of wall space but still want smart storage. 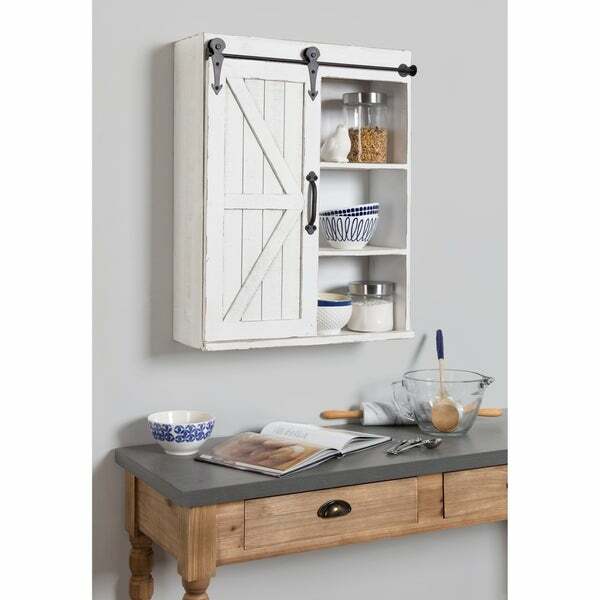 It'll work exceptionally well in an entryway, mudroom, kitchen, bathroom, living room, or guest room. The hanging cabinet has three inner shelves on the right side and two shelves on the left side to store items of different shapes and sizes. The single barn door slides to cover either side. The three shelves on the left side are each 10 inches wide, 6.75 inches deep, and there are just under 8 inches of height between shelves. The two shelves on the right side each are 10 inches wide, 6.75 inches deep, and have 12 inches of vertical space. The outer dimensions of this wall shelving unit are 21.5 inches wide, 27.5 inches high, and 8 inches deep. Two metal keyhole hangers are inset on the back of the cabinet for easy secure wall display. This wall cabinet arrives completely assembled ready to use. Dimensions 8.0 In. X 21.75 In. X 27.75 In. I’m in LOVE with this piece! It’s totally given my 1/2 RR a completely different look. I’ll now be looking for a mirror and light fixture to replace the ones I have and to make it look all together. The piece came already assembled and ready to install. It was well packed and protected for the shipment and arrived in less than 1 week. Although it looks heavy, it’s really not... I wish I could’ve weighed it before putting it up but I can tell you not to be concerned. Adding a picture for size reference! Love love love this cabinet. I am using it as a medicine cabinet in a very small bathroom and it works perfect. The door slides smoothly so that I can hide somethings behind it and use the other side for decorative items. Love it! 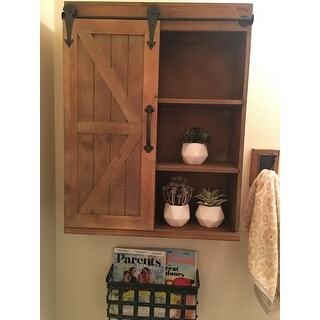 Beautiful wall cabinet for our powder room. Love it! Came put together too which was a huge bonus. Looks great on my bathroom wall and is perfect size! The color was great too! Highly recommend this storage shelf. 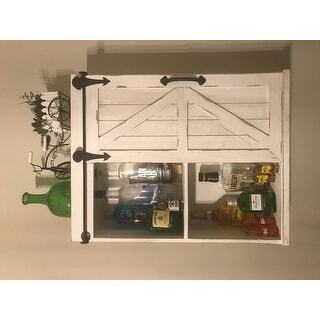 I ordered this cabinet to serve as a hidden bar in my home and it is perfect! I love that I can hide the bottles on one side and display the glasses on the other. I also love that I can display stuff on top as well! 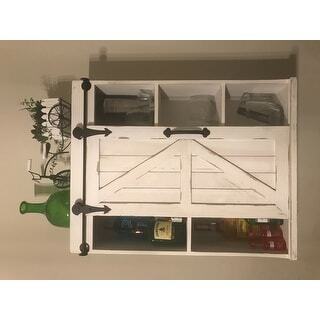 It is perfect if you are looking for a hanging bar for your home. The quality is great.. well made and heavy. I love it! Very lovely wall cabinet! 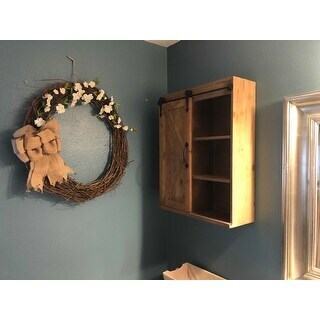 Used in our bathroom to hold washcloths/hand towels and the rest is decorative items. Not quite deep enough for bath towels. Nice that it already comes assembled and ready to hang! 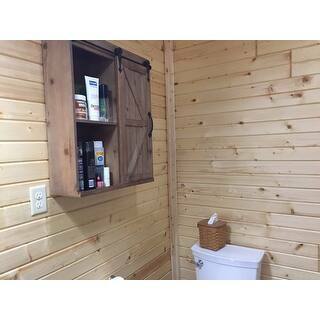 This sliding barn door cabinet is a beautiful additional to my newly renovated bathroom. The gray matched my decor perfectly. I would definitely recommend this product. Very unique piece. I just love it! I really like this cabinet. 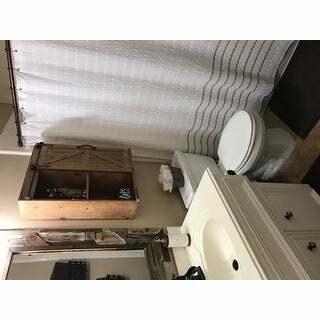 I got the brown one and it matches my "farmhouse" bathroom look. The quality is good, color is good (was hoping for a little "richer" wood look but still like it), style is great. 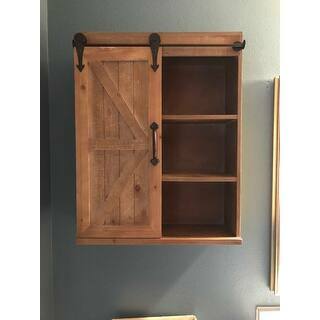 Sliding barn door was selling point for me and did not disappoint. Easy installation - even includes a template to hang which I found very helpful. First attempt and nailed it! 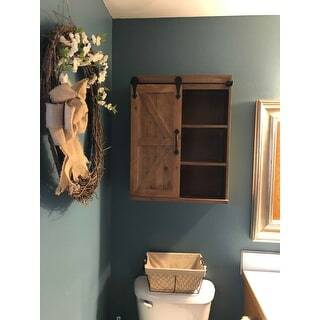 Love the look, perfect fit for my small bathroom. Material seems a little cheap and splinters easily, but overall I'm very happy with the product for the price. Very cute and charming! Will go well in my bathroom! Well made. I put this in my bathroom and it is gorgeous and spacious. Shipped very quick. Great quality and exactly what I wanted and will look fabulous in my updated bathroom. Perfect..! Arrived quickly and undamaged. 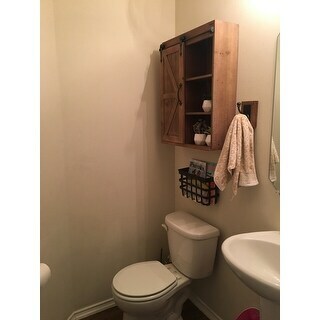 Extra storage for cabin bath. Would highly recommend. Love the rustic look. I ordered the brown...Happy with the color, but it is stainable if you choose to have it darker. Really nice made well cabinet!! It is super cute exactly what I wanted for our theme. We got the grey, it was not too difficult to set up either. I chose this product because it was the closest thing I could find to what I was looking for without having to make it myself. Reviews were good also.